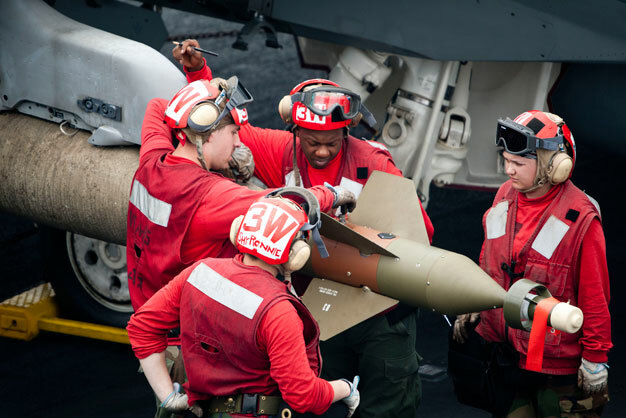 Aviation ordnancemen assigned to the Eagles of Strike Fighter Squadron 115 arm a GBU-16 Paveway II on an F/A-18E during flight operations aboard the aircraft carrier USS George Washington. George Washington departed Fleet Activities Yokosuka on May 26 to begin its 2012 patrol. George Washington and its embarked air wing, Carrier Air Wing 5, provide a combat-ready force that protects and defends the collective maritime interest of the U.S. and its allies and partners in the Asia-Pacific region. US Navy photo by Mass Communication Specialist 3rd Class Paul Kelly.